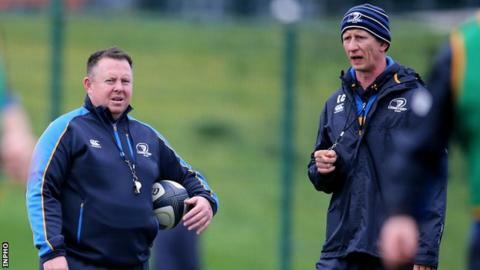 Leo Cullen has been appointed as the new Leinster coach on a two-year deal. The former Ireland international succeeds Matt O'Connor, who left the job after the Irish province's disappointing campaign last season. Cullen was forwards coach during the last year of O'Connor's reign and was installed as interim coach after the Australian's exit in May. The 37-year-old, who won 32 Ireland caps, captained the province to their three Heineken Cup triumphs. Leinster chief executive Mick Dawson said that Cullen's status as a player was "beyond question" after his 220 appearances for the province. "He is second only to Gordon D'Arcy in terms of senior appearances and he was an outstanding captain and leader on the pitch," added Dawson. "Over the last 12 months or so in his capacity with the forwards and indeed over the pre-season as interim head coach, Leo has continued to impress everyone at Leinster with his tactical and strategic direction." Kurt McQuilkin's short-term arrangement as defence coach has now been extended to the next two years with John Fogarty remaining scrum coach. Girvan Dempsey will serve as backs coach until the end of the World Cup when skills and kicking coach Richie Murphy will return from his duties with Ireland. Cullen's first game in charge will be the pre-season friendly with Ulster at Kingspan Stadium on Friday. His first competitive game will be away to Edinburgh in the Pro12 on 4 September.